CHINA: Goldwind has installed the prototype of its 6MW offshore turbine, over six months beyond the company's original development schedule. Goldwind said the 6MW machine is now operating at a test site in Dafeng, Jiangsu Province on the country's eastern coast. Originally, the company had planned to have the design for the new turbine finished in 2011 and a prototype operating by the middle of 2012, but numerous delays pushed back the installation date. Last March, Goldwind decided to accelerate the pace of the 6MW turbine development. 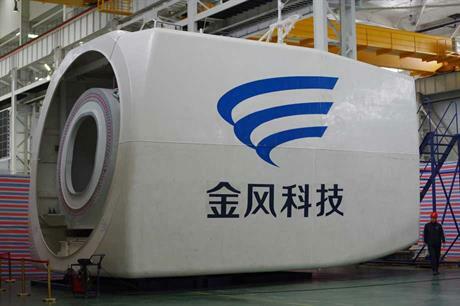 The company closed its MW-level turbine development company in Nanjing city, to shift all of the CNY 26.9 million ($4.3 million) funding to its Dafeng manufacturing base, tasked with building the larger turbine. The direct drive machine, which has a rotor diametre of 150 metres, is the result of an upgrade from a previous 5MW turbine development project. Despite offering 2.5MW and 3MW turbines, the company is still heavily reliant on its 1.5MW direct drive turbine that was originally built by susidiary Vensys in 2003. As well as the 6MW turbine, the manufacturer has also said that it is working on a 10MW turbine also for use on offshore wind farms. While the onshore market has slowed in China in recent years, the move into offshore is accelerating after a faltering start. The country has an ambitious target of 30GW of offshore wind by 2020.